For two thousand years India has been the very epitome of aspiration and otherness for the West. Alexander barged into it; the Romans complained of all the silver and gold they spent there; St. Thomas the Apostle is said to have preached in Keraḷa; Marco Polo stopped by; the Spanish and Portuguese not only aimed their carvels at it but applied its prestigious name to other discoveries. Yet Westerners end up not knowing much about it. This book will tell you all about the subcontinent! You’ll learn about which kingdoms Alexander was invading; the invention of zero; how Buddhism spread from India to take over Southeast and East Asia; how the modern nations of India, Pākistān, and Bangladesh developed. If you’re interested in languages— and if you’re reading my pages you probably are— India holds that glorious treasure, Sanskrit: the oldest-attested Indo-European language, and the spark that led to the discovery of that family. You’ll learn plenty about it here— a good start whether you intend to tackle Proto-Indo-European next, or the Rāmāyaṇa. Anyone who wants to know more about South Asia, its culture, religions, and languages. Conworlders who’d like to create an India-like con-culture, or set an RPG campaign in a historical or legendary India. Conlangers who’d like to aim at one of the most elegant and complicated fusional languages, Sanskrit, or imitate its sandhi rules (between-word phonological adjustments), or create an abugida (an ‘alphabet’ based on consonants with modifications to mark vowels). Writers who want to get away from European and American settings. An overview on pronunciation, topography, climate, provinces, old and new names, and language families. A brief historical atlas, with plenty of maps. A guide to India’s astonishing array of religions: Hinduism, Jainism, Buddhism, Zoroastrianism, Islam, and Sikhism. Daily life, including technology, the calendar, cuisine, and gleanings from ancient India's gift to conworlders, the Arthaśāstra. Chapters on architecture and clothing. A roundup of Indian literature, from the Rigveda to modern times. A chapter on conworlding: how to use all this information to create a fantasy culture that’s not the Standard Medieval European Kingdom, or an sf culture that’s not Fifties America in Space. Plus how to avoid a disparaging Orientalism. 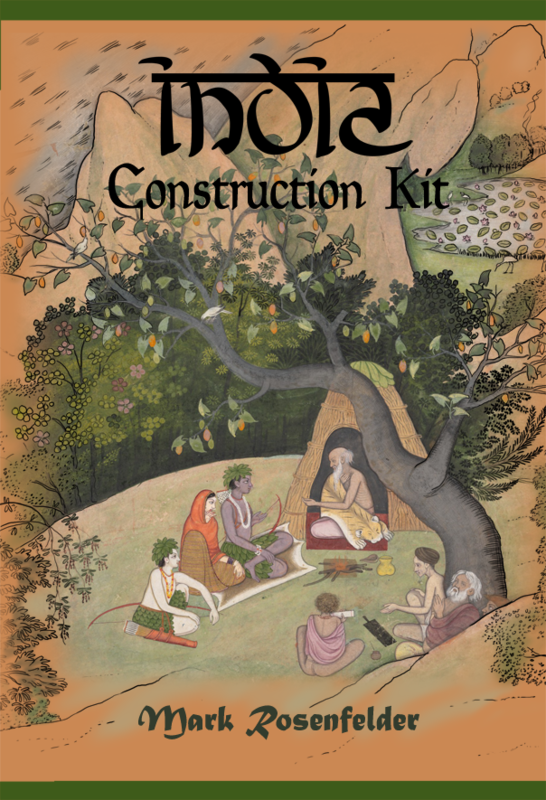 Grammatical sketches of Sanskrit, Hindī, and Tamil, plus an overview of the writing systems. An annotated bibliography, so you can learn more, as you will surely want to. I believe that my readers will not only expect but demand a high degree of linguistic pedantry. So this is one book on India that gives correct Sanskrit transliterations, points out cognates in other IE languages, and dives down deep into its exuberant morphology in the language section. Kauṭilya also tells us that three men are needed to oppose an enemy cavalryman; fifteen can repel an elephant. When Rāma, the ideal king and avatar of Viṣṇu, had to rescue his wife Sītā from the demon Rāvaṇa, his allies were an army of monkeys. The Chinese Monkey King Sūn Wùkōng may well be a borrowing of the monkey prince Hanuman. What seems to be a statue of the Buddha may well be another bodhisattva instead. A handy list of distinguishing characteristics is provided. The Indians had a fascination with high numbers; they had a word for 10145— dhvajāgraniśāmani. The British took the word ‘jungle’ from Sanskrit, but they got the meaning wrong— a jāngala is an arid, sunny region. What Westerners think of as “Indian food” is mostly Mughal (i.e. Muslim), as cooked by Punjabis. The idea of taxation was so ingrained that it was held that 1/6 of the merit won by a sage’s ascetic practice accrued to the king. Sanskrit is so full of synonymous compounds that a writer found it possible to write an epic poem that, using artful ambiguity, retells both the Rāmāyaṇa and the Mahābhārata. The Koh-i-Noor was one of the largest diamonds in the world when it was mined, but after two recuttings it is only 1/7 of its original size. A sāṛī is a long rectangle of cloth, 5 to 9 yards long. The book explains how exactly you wear one, and for good measure, how to put on a dhoti. If you like conworlding and conlanging, then definitely! More models that aren’t European history— or European fantasy— will deepen your own work. And if you don’t— well, this material is fascinating anyway! It’s well worth it to learn more about another major civilization. The price is $15.95 print (but Amazon often offers discounts), $6.25 Kindle. Do I get the sense this is part of a series? Apparently so! Here's the China Construction Kit. Do you cover Southeast Asia? Only very briefly, though this was India’s back yard for centuries. I do cover Sri Lanka and Nepāl. I’m a little intimidated by all the unfamiliar names. I sympathize. You can always take Linus’s advice for reading Russian novels: just bleep over the names. However, just like any unfamiliar material, it will get easier as you go. Plus, the nice thing about Sanskrit is how many basic roots have nice English, Greek, or Latin cognates. How about more tidbits to whet my appetite? Check out the India posts on my blog, which includes reviews of books as I was doing the research, and often contains details that didn’t make it into the book.